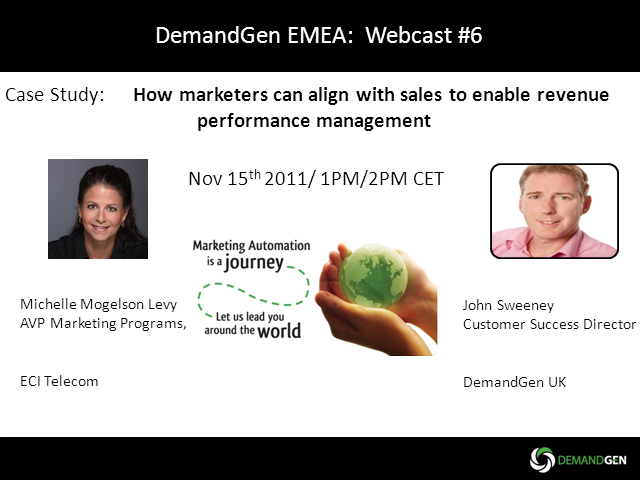 Join John Sweeney as he shines a light on Demand Generation best practice. Today' webcast features Michelle Levy, AVP of Marketing Programs at ECI Telecom. Marketers are under increasing pressure to show their contribution to the bottom line. They have evolved from a demand generation machine that was responsible for generating, nurturing and handing leads over to sales to marketers that are focused on bringing measurable value to their companyâs bottom line. The creation of the revenue marketer is the holistic approach to closed loop marketing and this requires sales and marketing to walk down the same path, hand in hand, with the same goals. So how do we make that change? Michelle Levy, AVP of Marketing Programs at ECI Telecom will share the formula which led to her teamâs successful alignment with a global sales team and ultimately led to the repositioning of corporate marketing as a valuable contributor to the companyâs bottom line. She will share their step by step plan on how they leveraged cutting edge technologies together with dedicated support to show to sales the true value of alignment, and the measurable results of this process and the effect it has had on the sales pipeline, active opportunities and closed business where marketingâs influence has made its mark within the sales organization.